Software creation, delivery and maintenance is continuously evolving. Packaging requirements have changed dramatically as consumption models have shifted from local to distributed and development preferences are changing from monolith to microservices. Compounding this complexity is that modern applications rely on a number of components and system dependencies (OS, Runtime, Database, Front End) to operate effectively and each of those has a lifecycle of its own. More and more frequently software needs to run in different formats for development and testing environments or businesses choose to run in multiple cloud platforms for effective redundancy. Packaging software in a single format for running locally as a Windows or Linux installer or as a standard virtual machine image is not enough. Developers and users require applications to be packaged as virtual machines, Docker containers, Kubernetes templates and optimized for one or more cloud provider platforms. Since our company was founded, the Bitnami mission has not changed: Make Awesome Software Available to Everyone! To deliver on that promise, Bitnami has built an application automation platform that manages the software lifecycle by building software stacks from core applications and their dependencies, packaging them for one-click deployment to all major platforms, local or cloud, and maintaining those stacks by monitoring for updates and security vulnerabilities in applications and any components. 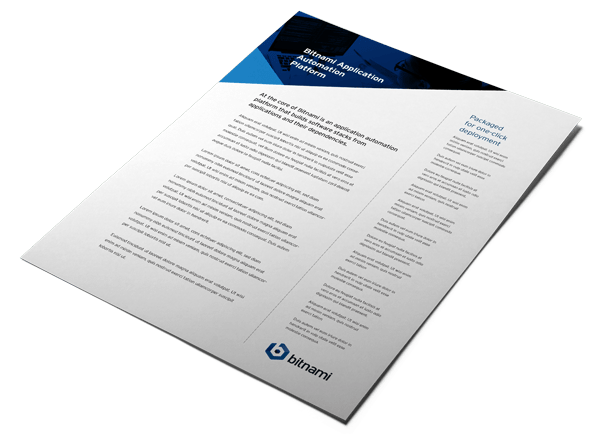 The Bitnami Application Catalog contains a growing list of 130+ trusted, pre-packaged applications and development runtimes ready-to-run anywhere and available from every major cloud provider. Bitnami Stacksmith is an end-to-end automation platform for building and maintaining your applications. Bitnami Stacksmith enables you to accelerate software delivery by automating the manual tasks required to package, deploy and maintain software stacks for all of the major container and cloud platforms.